Many local leaders had a say in taking the Grays Ferry PAL Center from conception to completion. For far too long, “Abandon hope, all ye who enter here,” which Dante Alighieri used in “The Divine Comedy” as the inscription for the gates of hell, has seemed an applicable warning to those residing in and venturing to Grays Ferry. Crime, addiction, and poverty have often threatened to throw the proud neighborhood into perpetual upheaval, especially with respect to the lives of its children. 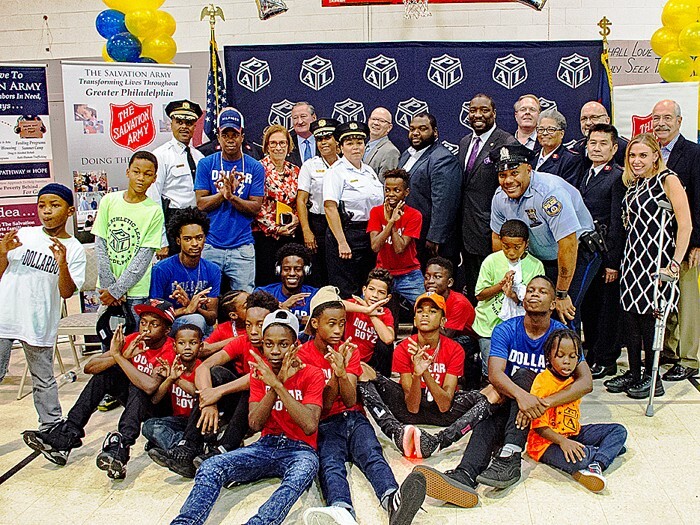 On Friday, though, hopeful helpers looked to counter the conundrums by opening the Grays Ferry PAL Center at 3225 Reed St.
With more than 100 children gathered before them, the South Philly product and peers promoted the benefits of the partnership between the Police Athletic League and the Salvation Army Greater Philadelphia. Already the overseer of the Grays Ferry Outreach Center within the building, the latter organization loves making the downtrodden turf a place when one should come to discard fear instead of hope. The opening of the impressive space, including the gymnasium where dignitaries and community members fraternized, signals the end of PAL’s two-year absence from the neighborhood and gives Grays Ferry trustworthy allies in reducing regrets and remorse. The resident of the 3200 block of Dickinson Street and his nine-year-old descendant, who would join more than 200 children as a registrant, delighted in hearing all of the speakers, with state Rep. Jordan Harris drawing their most robust applause. HARRIS ADDED THAT a space that could prove a boon for the troubled area had always come up in meetings with residents. That desire for diligent means to inspire dreams met the ears of then-councilman and mayoral candidate Kenney last year when he attended a barbecue at Stinger Square Playground. In looking to lead youths to make better decisions and to establish stronger relationships with contemporaries, family members, and educators, the site, which is open from 3 to 9 p.m. on weekdays, will call upon Frank Holmes to be a beacon for their maturation. More than 18,000 youngsters participated in PAL programs last year, so the new spot’s leadership team is eager to swell that total and finds itself thankful for children like Raymir Richburg. The student at the James Alcorn School comes to the Grays Ferry PAL as a part of a group, proving a perfect poster child for the claim that there is strength in numbers. Regardless of whether he continues to come with company or whether any other local boy or girl makes individual or group stops, Ferreira knows their time at the destination will always serve as an appealing alternative to the appalling choices that problems in the home, spats with their friends or enemies, or sadness over the direction of their lives could lead them to make. Call 215–291–9000, or visit phillypal.org/join-us/enroll. Contact Staff Writer Joseph Myers at jmyers@southphillyreview.com.